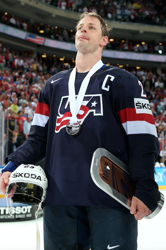 Hendricks led Team USA to a bronze medal at the 2015 IIHF World Championships. Matt Hendricks has visited Xcel Energy Center dozens of times throughout an NHL career that spans 11 seasons. The only difference is now it’s no longer as an opponent, but instead as a member of his hometown team, the Minnesota Wild. We caught up with the proud Blaine Bengal and St. Cloud State Husky to learn just what it means to be back in Minnesota, and how developing his game here in the State of Hockey has allowed him to enjoy a pro career that includes 113 points (54 goals, 59 assists) in 581 games. Minnesota Hockey: First things first, welcome home! Has the smile left your face since July 1 when you signed that one-year contract with the Wild? Matt Hendricks: Not really. I’m looking forward to (being here). This is going to be a very fun season, a very good season I think. I changed my phone number [with all the ticket requests from family and friends]—I’m just teasing, it’s been pretty good so far. There’s a lot of spirit in Minnesota from Wild fans for Wild players, that’s for sure. Wild flags all over the place, a lot of jerseys, even though it’s not hockey season, you can still feel that excitement, and I’m excited. MH: Let’s take it back to youth. You amassed 110 points in 43 games with the Bengals, and won a 2000 Class AA State Championship to cap off a successful prep career—what exactly does high school hockey mean to you? Hendricks: Growing up as a kid, watching the state high school hockey tournament, wanting to partake in the state high school hockey tourney and getting those opportunities to play in it, those are some of the best opportunities I had in all of my career. You’re playing with your best friends that you grew up playing hockey with. MH: Having played in plenty of different hockey markets, do you have an even bigger appreciation for those high school opportunities, and the importance it has in a player’s development in Minnesota, now? Hendricks: Absolutely. It is a really unique opportunity we have here in Minnesota. There must be at least one or two guys every year that will ask on my team, ‘oh you didn’t play junior hockey, you just played high school hockey?’ A lot of them don’t even know what high school hockey is. Maybe prep school would be different, but high school hockey is kind of foreign to players outside of Minnesota. But I wouldn’t change any of it. I played three sports at Blaine High School, I never just played hockey. I played baseball and football. I’ll never forget, my senior year we lost in the (football) state tournament to a pretty good football player, Joe Mauer, Cretin Durham Hall. I’ll never forget that. He was pretty good though. Bottom line is all of that contributed to becoming an overall athlete. It helped me develop as a player and person. I wouldn’t have done it any different and would still choose high school over juniors, just like I plan for my kids too if that comes up. MH: It’s got to be kind of fun to have it come full circle and bring your kids back here to develop in Minnesota, huh? Are we looking at Bengal blue for them, too? Hendricks: We’re actually moving in to the Minnetonka area, so he’s going to be a Skipper. I told him I don’t know if he’s from the right cloth to be a Bengal. That’s tough to be a Bengal. But yes, it’s very neat. I have twins [a boy and a girl, Gunnar and Lennon], they turn seven in November, but my son plays hockey and he thinks it’s really neat to be in Minnesota. Mom bought him a Wild t-shirt, and he’s excited—he’s telling his friends, so it’s special. MH: In addition to the high school hockey component, what makes playing hockey in Minnesota as a kid unlike any other place? Hendricks: I think the greatest thing about Minnesota with youth hockey is how many good coaches there are out there; how many coaches played, whether it be professional or through college or even just really good high school or junior players. There are a lot of great coaches and a lot of great outlets for kids to get involved and kids to get out and skate. So first and foremost, the opportunities for kids and their coaches, Minnesota is bar none the best. MH: Final question—where do you see yourself fitting in with this Wild program, that really is plump full of plenty fellow Minnesotans as well. Hendricks: I’m hoping to come in and just try help strengthen the culture a little bit. I want to be a player that shows up every day, works hard, leads by good examples, and shows up ready to play, ready to do his job, fill that niche whatever it might be.